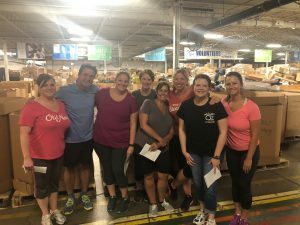 We were so pleased to be a part of Matthew 25 Ministries operations for a day and were all so impressed with how they make their volunteers feel so welcome. We were able to take the tour of their facilities and learn all about the relief they provide and difference they make to communities across the globe. If you are not familiar with the work of Matthew 25: Ministries does- they help the poorest of the poor and disaster victims throughout the United States and around the world. 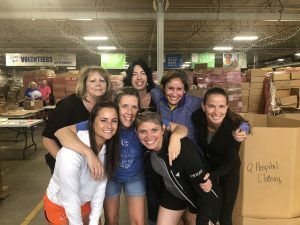 They accept monetary donations and product donations of misprinted, slightly damaged, over-stocked or gently used supplies from corporations, organizations and individuals nationwide. They also supplement outside donations by manufacturing, assembling and blending products in-house including school notebooks, pencils, rice-soy meals, and paint. 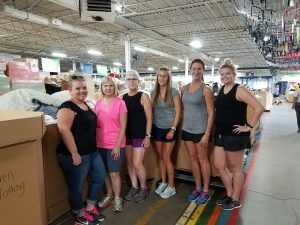 With the help of their volunteers, these goods are processed at their 168,000 square-foot Processing Center in Cincinnati, Ohio and then shipped via forty-foot seagoing containers and by semi-trailers to the poorest of the poor and disaster victims. More than 99% of Matthew 25: Ministries’ cash and in-kind donations go toward programs. If you are interested in donating or volunteering to Matthew 25 Ministries please visit their website here.